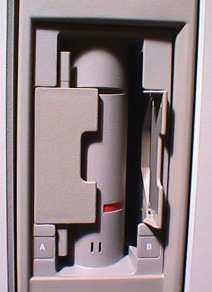 The Computer Closet's Rainbow 100, pictured here, is mounted in the optional tower case from Digital. The machine itself is actually slightly smaller than an IBM PC. The standard chassis simply slides into the tower case module, and a rear door covers the cabling. Without the tower case, the Rainbow simply sat horizontally on a desktop.